This is a Nigori sake, which means it was unfiltered and has more rice particles; this creates a cloudy sake with a distinctive sweet taste. Tropical notes of starfruit and guava hit the palate with a refreshing burst of flavor along with anise and melon flavors. A creamy and spicy finish. Shake before serving chilled. Goes well with spicy food. 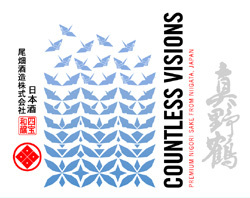 The label is inspired by the Sado Island Noh poet Zeami.